(Newser) – Competing in a bass fishing tournament two years ago, Todd Steele cast his rod from his 21-foot motorboat—unaware that he was being poisoned. 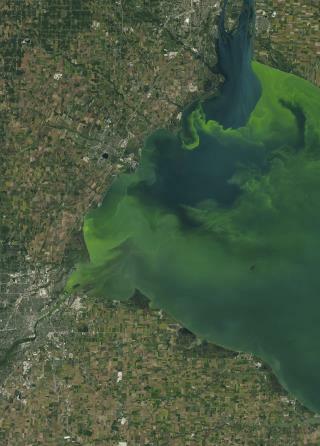 A thick, green scum coated western Lake Erie. And Steele, a semipro angler, was sickened by it. Driving home to Port Huron, Michigan, he felt lightheaded, nauseous. By the next morning he was too dizzy to stand, his overheated body covered with painful hives. Hospital tests blamed toxic algae, a rising threat to US waters. "It attacked my immune system and shut down my body's ability to sweat," Steele said. "If I wasn't a healthy 51-year-old and had some type of medical condition, it could have killed me." He recovered, but Lake Erie hasn't. Nor have other waterways choked with algae that's sickening people, killing animals, and hammering the economy. Algae are essential to food chains, but these tiny plants and bacteria sometimes multiply out of control. Within the past decade, outbreaks have been reported in every state, a trend likely to accelerate as climate change boosts water temperatures. Many monster blooms are triggered by an overload of agricultural fertilizers in warm, calm waters, scientists say. Chemicals and manure intended to nourish crops are washing into lakes, streams, and oceans, providing an endless buffet for algae. Government agencies have spent billions of dollars and produced countless studies on the problem. But an AP investigation found little to show for their efforts; it goes into the reasons why in depth here. One issue: Instead of ordering agriculture to stem the flood of nutrients, regulators seek voluntary cooperation, an approach not afforded to other big polluters. I have been studying the problem for now years in the lab and in the field. The symptom is toxic algae (HAB). The root cause is runaway nutrient loading of nitrogen and phosphorus entering the eco-water system from septic, runoff and detergents. Our company, AN-JET, is on the forefront of algae and water solutions. We have designed systems from small to large. The answer is control of the source/s of the pollutants. Prevention, not remediation is a better answer and far cheaper than remediation, but the political and economic will to control runoff is simply not there. We have both systems and are working on new science all the time. Footnote: Be advised, the mycotoxins from certain algaes are not being removed from water at public water treatment systems. The most egregious, toxins require 1000F degrees for 5 minutes. Might be a good time to distiller and don't shower with your mouth open. Distillation works well, but Electro Separation with recombination is better. Add back mineral salt to improve taste and gain needed minerals. Bottled water is mostly a joke as their feed sources are public water systems. If you want to know more about prevention or remediation products, give us a shout. I suppose those busybodies at the EPA are saying that this is a bad thing.